HEAD : I can’t find a damn semi-transparent mixing bowl to appropriate as Noodle’s noggin. So, I went with a plastic bowl I bought a while back because it was Robot Army gray and yellow. The size isn’t right, but tilted at an angle with his eyes poking out it looks a lot like a helmet… and I’m okay with that. SHOULDERS : I went to the store with Mark yesterday and searched through all of the collars in the pet isle to find a replacement for his old harness which no longer fits around his new planetary gear assembly. There were many small kitty-sized bands with big jingly bells… but not a single one was in neon yellow. So I didn’t bother getting any. In leu, I smashed noodle’s old harness back onto his gear box so that if needed I can still hook him into the leash hanging from the ceiling above the work table. It lacks a proper bell… but fashion is second to safety. KNEES : I think noodle needs socks. TOES : He needs socks because I still haven’t been able to locate some of those stupid squishy stress balls which I plan to halve and mount to the bottom of each of noodle’s feet. These should help give him some traction as he attempts to walk. Someone pointed out that the foam material of the noodle was just sliding on the smooth surface of our table which was why he didn’t get very far during his first test run…er- walk. Any how… the socks will keep the bottoms of his noodles clean until they’re capped with said squishy foam balls… Because tomorrow I’m taking noodle on his first ever outing into the big wide world. When your baby is learning to walk, you make sure its near soft things and away from stairs so that when the inevitable fall occurs, they don’t collapse into pieces. When your baby is a robot learning to walk, bungie chords and harnesses are also needed. And in the case with noodle, who is delicate and wobbly like a skittish baby fawn, I am sparing no precaution! Robots get rigging. 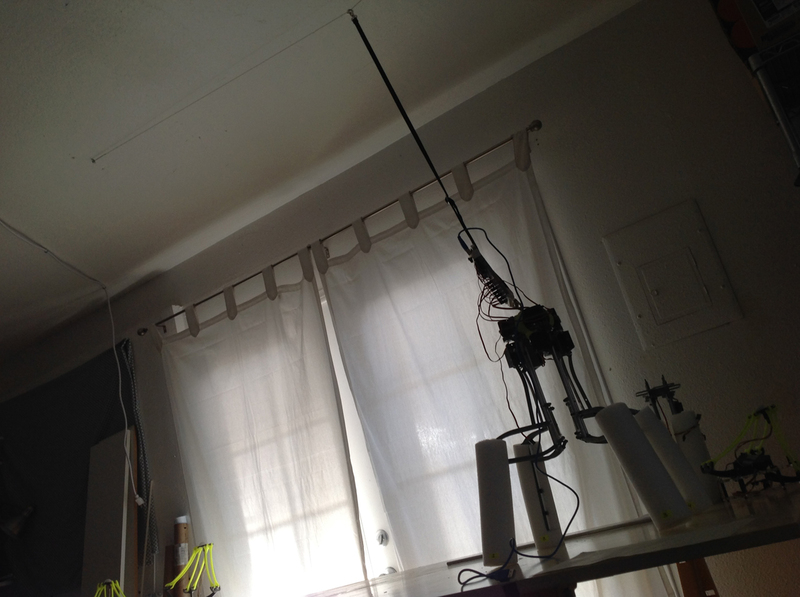 Mark took the time this weekend and installed a guide wire on the ceiling over our work table. A “leash” hangs down from this wire and clips on to noodle’s smashing neon-yellow harness which wraps around all four of his legs. If he loses his balance, he won’t have very far to fall before the leash pulls tight and catches him. 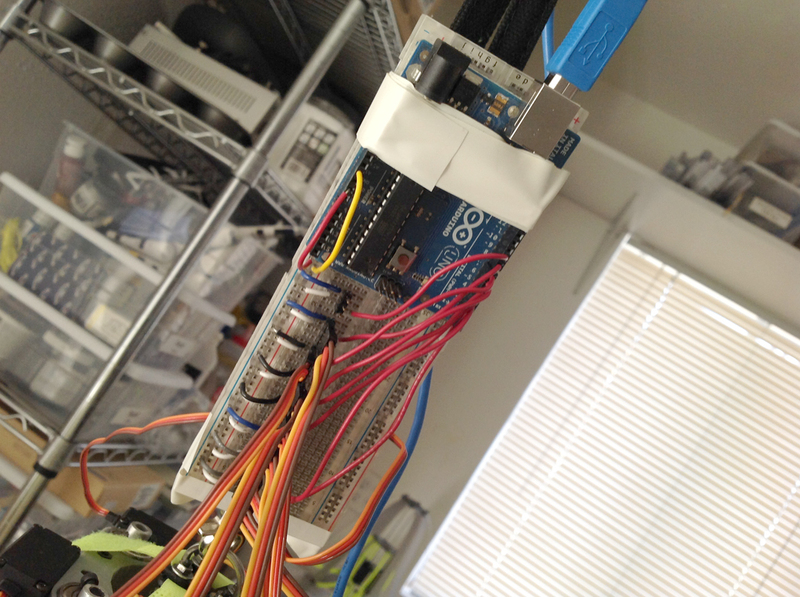 Before assembling noodle for his big day, I had to calibrate all of the servo motors to 90º. Only then could I screw the gears to the motor shafts, as well as connect the pulley bits from the secondary servo motors on each leg to the bendy bits. In the end, once all of the final parts were attached to one another, I was pleased with how solidly he stands on his own. Hopefully I can figure out the right way to distribute balance so that he can lift up his feet and walk. Lastly, this afternoon I taped an Arduino down to the end of a breadboard and fashioned some male headers so that the servo motors could easily plug-in and tether to their appropriate pins. The breadboard itself is taped directly to the leash so that it will move with noodle as he walks… or falls.